Buyer Personas: Nicer than Stereotypes? We have NASCAR dads – blue-collar, middle-aged Caucasian men who graduated from high school and like watching stock car racing. And don’t forget the millennials – young adults who are entitled and lazy, live on their phones, and were raised by helicopter parents. Are those stereotypes or personas? The soccer mom designation, which came of age in the 1996 U.S. presidential election, and NASCAR dads, which became a target audience in the 2004 elections, are closer to personas, though too thinly described. And millennials? Well, those are more likely stereotypes that have been around for most of this century. We posed the stereotype-or-persona question to marketers and got their input on preferred ways to develop useful audience profiles. And, in some cases, they share why – stereotype or not – personas aren’t a good fit for their marketing. A small business owner is not some guy in a striped apron who smiles with pride as he turns around the “open” sign and picks up a broom to sweep up his shop. That’s the stock photo of a small business owner. A small business owner persona needs to have a name. Let’s say it’s Mike. And Mike needs to wake up super early every weekday because it’s the only time he can respond to emails without being constantly interrupted. He wears an ugly pair of khakis on Fridays because he hasn’t had a chance to do laundry. He’s down one team member, which means he needs to spend a lot more of the day working directly with customers. He likes doing it, but it keeps him from getting all kinds of other stuff done during the workday. Tonight, Mike has big plans to watch Friends reruns on the couch while running the payroll he wasn’t able to complete this afternoon. Does Mike need a blog post on six tips to improve productivity at work? No way. He needs a post about six lifesavers to make sure nothing slips through the cracks. When your audience goes from being a cardboard cutout to a real persona, you and your team can empathize with them – and do a much better job of creating content, messaging, and calls to action that really resonate. The term “stereotype” can be negative when the interpretation is so oversimplified as to overlook nuances. But we have to start somewhere, right? In my experience with B2B clients, applying three mathematical and common-sense principles makes the stereotypical buyer persona a great starting point. Acknowledge outliers and still tell a relevant story: A former client sold services to B2B companies, primarily targeting marketing directors. Research and anecdotal experience showed the target buyer was a woman, ages 35-45, with the ability to sign off on purchases up to $25,000. One salesperson concluded the persona was a waste of time because he had one male client and his female client was 47. Since the other 98% of prospects did fit the persona, my advice was to use messaging that addresses the business needs and decision-making authority of the persona. The risk of stereotyping was not in the targeting, but in the messaging. If we assumed that all women have children and drink wine, we might miss the mark. But if we assume all marketing directors want to deliver messaging and pipeline, relevant messaging should still connect with demographic outliers. Use current data, not outdated anecdotes: Beware of anecdotes delivered in a loud voice with no supporting data. A federal contracting client selling software needed to reach senior-level HR decision makers. After conducting a competitive assessment and focus groups, our team determined the buyer persona was an African-American woman with a master’s degree, promoted into a senior role within the last five years. The client vociferously rejected that persona. After much arguing, we figured out the client’s buyer vision was a white male over 50 with a bachelor’s degree. While true in the past, that information was five to 10 years out of date. The problem was not the stereotype, but the timing. Test and learn the persona hypothesis: The notion of marketing to a static buyer persona is dead. Think of your buyer persona as a starting point and use marketing automation to continuously test and learn. Yes, you may have research that shows an 18-month buying cycle for contracts over $100,000. But if your campaign activity reveals a pool of prospects willing to move more quickly, use those data points to refine and target so you can keep improving your segmentation and content delivery. The problem with personas is not that they are stereotypes but that some people are lazy and default to them. Paraphrasing marketing legend David Ogilvy, use personas for illumination, not support. Just because some people are lazy, not conceptual, can’t do analysis, and thus just take the personas at face value doesn’t mean that we throw the Baby Bernice out with the Billy Bob Bathwater. When used properly, buyer personas are a huge contributor to marketing, sales, and overall business success. Consider the case of content juggernaut HubSpot. In the HubSpot: Inbound Marketing and Web 2.0 article in Harvard Business Review, they analyze the personas Owner Ollie versus Marketer Mary. They both bought HubSpot but cared about different things. So what? Well, it turns out that Marketer Mary had twice the lifetime value profit to HubSpot than Owner Ollie. This allowed them to target their efforts, apply marketing and sales messages, and invest the right amount of resources in marketing to one versus the other. In teaching an undergraduate PR course, I asked the students to develop a campaign to attract more minority students to the communication and journalism department. I talked about understanding the target audience, learning about their media consumption habits, interests, values, etc., and creating promotional materials to appeal specifically to that audience. But in the end, none of the campaigns had a clear focus on a targeted minority population. In a debriefing, I learned that the students felt it was wrong to stereotype minorities. The experience was fascinating to me because, inherently, advertising is about stereotyping. It’s about segmenting, targeting, and positioning your messaging to target a narrowly defined audience. It’s important to create buyer personas to help you understand the target audience from two perspectives – what media they consume or visit and what do they value. I wrote a drafted brand persona first based on my assumed stereotypes – visitors to a trucking job board are middle-age men who have or are looking to get their CDL. I then went into our Google Analytics account to prove what assumptions were accurate and which were not. My assumptions were accurate, though I learned 30% of the audience were women (a future opportunity). The data from our website helped me to create a brand persona that was based on fact. You need to acknowledge that you’re selling a product to three-dimensional people who are complicated and have a variety of interests and needs. An example of a good buyer persona is this commercial for Beats by Dre, featuring YouTube star Liza Koshy. It highlights the complexities of its target audience (15- to 24-year-olds) without isolating other demographics. Younger crowds will recognize the YouTube star and the struggle of working. Meanwhile, older generations will appreciate the professional/built-for-bosses angle. Most importantly, Liza Koshy’s comedy style shines throughout the commercial as entertainment that is family friendly and doesn’t exclude specific portions of the population. HANDPICKED RELATED CONTENT: Are Your Buyer Personas Ready to Take on the World? We choose not to use buyer personas. We would be severely limiting ourselves if we restricted ourselves to a very specific type of customer. Instead, we set a broader aim of simply targeting online business owners and refining our website copy to strengthen our voice (fun, passionate, but serious about what we do). We know that this alone is what is (and what will continue to be) attracting the right audience for our product. In a way buyer or customer personas are stereotypes. In creating a persona, you’re taking a broad ideal, and using your preconceived notions to determine behaviors and interests. However, there are some ways to avoid going down the dangerous route of using stereotypes in buyer personas. For example, consider the language you use. If you have a customer persona that says, “hipster, likes indie music, writes poetry, shops at Starbucks, owns a Mac,” you should be ringing alarm bells. In fact, the use of “hipster” alone in your persona is a red flag as it’s clearly stereotype territory. That’s all fine in the brainstorming stage, but make sure you step back and look at what you have down before you do anything with it. You’re not limiting your brand to solely targeting people who identify as hipster. Even better, create multiple personas. As for buyer personas, aka avatars, I have always steered clear of them for one big reason. These kinds of profiles created by marketers are creating an idea for an “average” customer, but who considers themselves average? Are you an average parent? An average person? An average daughter? An average writer? An average marketer? The problem with avatars is you end up writing to nobody. It has always seemed to me that creating these kinds of profiles is an excuse and way to procrastinate from talking to real customers! Why on earth would a marketer create a fake person when they have so many they could talk to in real life? When personas are created quickly, without the collection of data, real-person insights and so forth, then it can be challenging to distinguish between a stereotype and a persona. When quickly crafted, for example, a marketing team may determine that all people of a certain demographic act in or feel a certain way. All older people get lonely, right? Everybody knows that, right? But, then the team discovers an in-depth study showed only 43% of older adults feel lonely. They do additional research on the targeted audience then the stereotype begins to be fleshed out, ideally into a useful persona. If the business model is to help older adults become engaged in their communities through the company’s services, then the marketing team will need to get rid of the idea that all older adults are lonely and focus on learning more about the 43% of older adults who do experience loneliness to create a three-dimensional persona. How often does this subset of older adults eat out as compared to those who don’t feel lonely? How many older adults – in the lonely subset and the not-lonely subset – still independently drive? Even at night? Is health a factor? As you understand what motivates your target audience, what his or her needs, goals and wants are, what behaviors he or she engages in, then your persona will leave flat, shadowy, one-dimensional stereotypes behind in the dust. 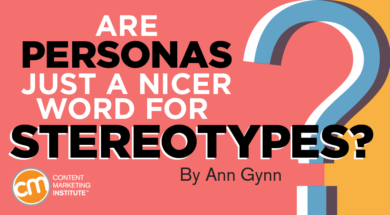 Are your personas really stereotypes? As these marketers reveal, the answer is only the first step. The bigger question to ask is how well can you and your team describe your target audience(s) and deliver that audience to meet your company’s goals? Could you, as Elliott Brown suggests, write a 500-word description of your customer’s day? If not, spend time with three to five of your customers. Take them to lunch or for a beer. Spend some time learning why they’re a customer and most of the time getting to know them as a person. Understand the details of who they are. Then you can write that 500-word description. Want to know who fits the content marketer persona for CMI? You’ll meet them at Content Marketing World Sept. 4-7 in Cleveland, Ohio. Register today using code BLOG100 to save $100.